Select these fields from the Film table. Add an Integer parameter to the report called CountryID. 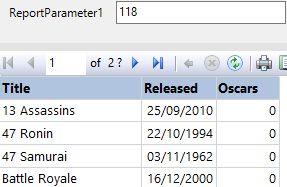 Use the parameter to filter the dataset so that it returns only films whose CountryID field matches the value of the parameter. Enter a number to test the report. Here we've used 118 which is the CountryID for Japan. Edit the parameter to make it hidden then save and close this report. Select these fields from the Country and Film tables. Add a table which displays the Country field. Apply a group expression so that the table is grouped on the Country field. Add an expression to the table to count the number of films for each country. The design of the table should resemble this one. Assign an action to the Country text box so that clicking it opens the previous report you created and passes the value of the CountryID field to its parameter. Apply these settings on the Action page of the Text Box Properties dialog box. You could apply formatting to indicate that each country name is clickable.